With YouTube now bringing in more than 1.8 billion users every month, the video platform is approaching Facebook’s colossal status (2bn+ monthly users) as a social and advertising giant. In this guide, we’re going to explain how to advertise on YouTube, why you should consider the network in your marketing strategy and what you can do with its ad formats. Does YouTube really connect you with consumers? In terms of reach, YouTube has got plenty for you to work with – we’re talking about the world’s second-largest search engine after all. Having said that, reach alone isn’t enough to make a great advertising platform. YouTube might not be the first platform that comes to mind when you want to connect with consumers. However, Google research shows us there are millions of consumers turning to YouTube for product reviews, travel inspiration, tutorials, how-to videos and all kinds of content that has commercial value. In fact, 40% of YouTube users over the past year have turned to the network to learn more about a product before they went ahead and bought it. 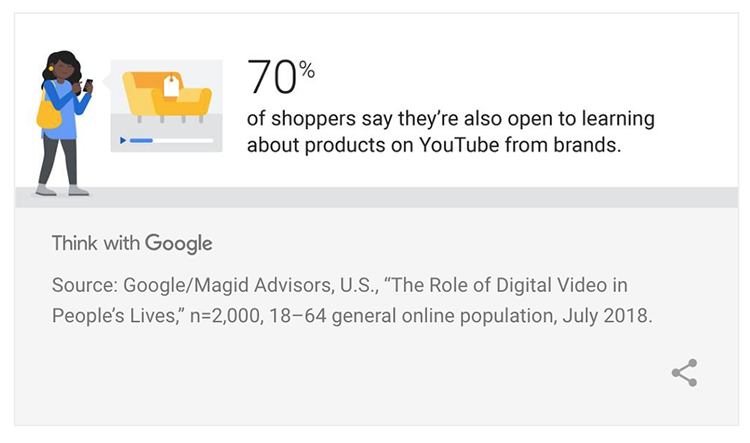 People are increasingly turning to YouTube for inspiration too; a massive 70% of users say they’re open to learning about products from brands on the platform. That’s a big deal for advertisers. YouTube has evolved into a genuine consumer platform that has a major influence on people’s buying decisions. This, combined with Google’s advertising smarts, makes YouTube a platform every brand wants to reassess in 2019. What kind of ads can you create on YouTube? In this section, we’re going to look at the six different types of ads at your disposal on YouTube. We’re going to break these into two categories – starting with video ad formats and then looking the remaining three ad types. You can find a quick summary of all six ad formats over at Google Support. We’ll also be explaining YouTube display ads, overlays and promotional cards once we’re done talking about the video ad formats. TrueView video ads (also known as skippable video ads) are the most engaging video ad format on YouTube – up to 500 percent more than other formats, according to Google research. There are two types of TrueView ads on YouTube – in-steam and discovery – but you’re probably going to be using the in-stream format more often. In-stream ads play before or during other YouTube videos in the main player. These are the ads users can skip through after watching the first five seconds, which means you’ve really got to make those first few moments count. You only pay for TrueView in-stream ads when a user watches 30 seconds of your footage or views the whole thing – whichever comes first. This format is very popular with advertisers, thanks to its budget-friendly nature. It’s also arguably the least intrusive ad format for YouTube users. As for TrueView discovery ads, these appear alongside other YouTube videos, in search pages or on websites on the Google Display Network. For these, you only pay when a user clicks on your ad to watch your video. TrueView in-stream ads are a great way to tell a brand story, as long as you’re able to win those first five seconds. They’re also a great format for teasing new product releases, inspiring travel ideas or quickly highlighting a consumer problem and then providing the solution. While the fact you only pay when a user watches for 30 seconds or your entire ad makes these a low-risk format that’s friendly on budgets of all sizes. 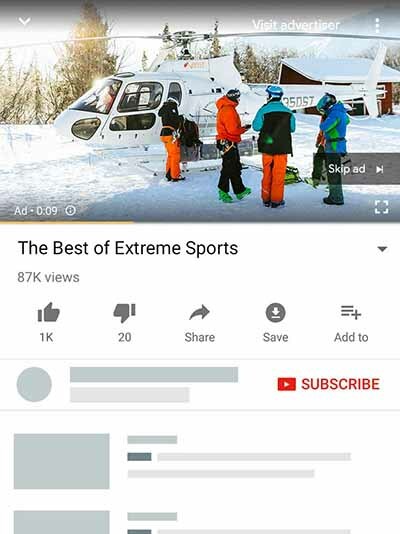 Non-skippable ads also play before or during another YouTube video but – as the name suggests – users have no option to skip through your ad. While there’s no time limit with TrueView ads, there’s a limit on non-skippable ads of 15 or 20 seconds, depending on regional standards. In 2018, Google stopped supporting the 30-second non-skippable ad format because… well, people don’t like non-skippable ads all that much. Which is something you’ll need to keep in mind when it comes to using these. Non-skippable video ads are the most intrusive format on YouTube, although they come with the benefit of users having to sit through your entire ad. Non-skippable ads are paid for on a CPM (cost per thousand views) basis. Another great format for telling brand stories with the pro/con of being a more intrusive format. You really have to work hard to make these things engaging to capture people’s attention and inspire them to take action. Bumper ads are basically non-skippable ads with a six second time limit, offering something of a compromise between the TrueView and non-skippable formats. If you can get your entire message across in six seconds or less, this is definitely the format to go for – something that’s easier said than done though. A good approach is to use bumper ads to complement your TrueView or non-skippable ads to tell a broader story and increase engagement. Once again, bumper ads are paid for on a CPM basis. Getting across a short, powerful message or a small part of a larger story. These combine really well with TrueView ads if you’re able to turn those six seconds of bumper footage into enough interest that enhances your message the next time users see your TrueView ad. Okay, so those are the three types of video ads you’ll be using on YouTube, but before we move on to the other three types of ads you can use, we should take a moment to talk about YouTube vertical ads. This isn’t a new ad type in itself but rather a new format for TrueView and Universal App ads, designed with mobile users in mind. 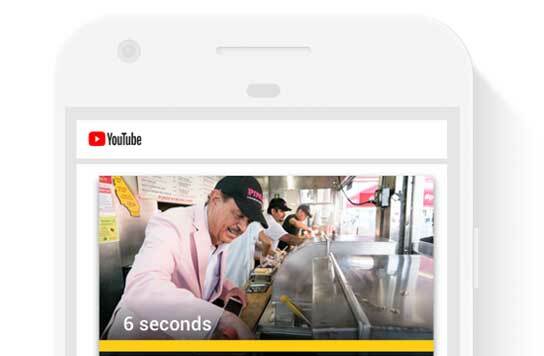 Google says more than 70% of YouTube watch time now happens on mobile and the vertical ad format caters for users watching videos in portrait mode. More importantly, it automatically adapts your TrueView ads for vertical viewing, although there are some new best practices you’ll need to follow to make sure your videos are suitable for adaptation. You find out more about these best practices over at Google Ads Help. Now, let’s move on to the remaining three types of YouTube ads you can use. YouTube display ads are a desktop-only format that appear above the list of video recommendations, to the right of the video player. They may also appear under the video player, depending on the size of the player in the user’s browser. Best used to reinforce your video ads (there’s a placement that allows you to show both video and display ads to users in the same session). Get your story and core message across in the video ad and repeat your CTA in the display ad to encourage more users to take action. Just keep in mind that YouTube display ads only appear on desktop. They can also be effective on their own for branding and awareness campaigns. Overlay ads are another desktop-only format. These appear as semi-transparent overlays across the lower 20% portion of the video player. They are essentially banner ads for YouTube which can be in either text or image format. They’ll only appear once the video starts playing and users are able to continue watching their video of choice without any major interruptions. Once again, overlay ads are a great way to reinforce your YouTube video ads. You can go with a triple helping of display, overlay and video ads to really hammer your message across to desktop users. This allows you to show one offer in your overlay ads and another in your display ad, effectively doubling up on your CTAs. Sponsored cards are unobtrusive ads that show content relevant to the video users are currently watching – for example, products featured in the video. Viewers will see a teaser for the card for a few seconds, then they can click on the icon in the top right corner to explore the cards. Promoting messages relevant to the topic, products or services featured in a video. For example, you could feature sponsored cards for Nikon camera gear on the latest video reviews for their latest release or promote wellbeing products on video blogs covering the topic. Now that you know which ad formats are available, it’s time to look at how you can deliver them to the right audience – and this means talking about YouTube’s targeting options. YouTube offers an extensive range of targeting options to help you get your ads seen by the right people. These come under two categories; audience targeting and content targeting. Demographic groups: Choose the age, gender, parental status or household income of the audience you want to reach. Detailed demographics: Reach users based on additional broad shared traits, such as college students, homeowners or new parents. 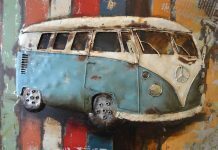 Interests: Pick from available audience categories to reach people interested in certain topics, even when they may be visiting pages about other topics. Affinity audiences: Raise brand awareness and drive consideration with your video ads by reaching people who already have a strong interest in relevant topics. Custom affinity audiences: With custom affinity audiences, you can create audiences that are more tailored to your brands, compared to our broad TV-like affinity audiences. For example, rather than reaching sports fans, a running shoe company may want to reach avid marathon runners instead. Life events: Reach potential customers on YouTube and Gmail when purchasing behaviour shifts and brand preferences change during life milestones like moving, graduating from college or getting married. Custom intent audiences: Built with performance advertisers in mind, custom intent audiences allow you to reach viewers as they’re making a purchase decision based on the keywords they’ve recently searched on Google.com. Video remarketing: Reach viewers based on their past interactions with your videos, TrueView ads or YouTube channel. If you’ve linked your Google account to your Google Ads account already, Google Ads will create custom lists for you automatically. Topics: Target your video ads to specific topics on YouTube and the Google Display Network. Topic targeting lets you reach a broad range of videos, channels and websites related to the topics you select. For example, you target to the “Automotive” topic, then your ad will show on YouTube to people watching videos about cars. Keywords: Depending on your video ad format, you can show your video ads based on words or phrases (keywords) related to a YouTube video, YouTube channel, or type of website that your audience is interested in. Devices: Target users using computers, smart phones, mobile devices and TV screen devices like Chromecast. Once you’re familiar with the different types of ads you can create on YouTube and the targeting options available, you’ve got everything you need to start influencing buying decisions on the network. To give you a head start though, we’ve got some tips to help you make an impact faster and turn video viewers into valuable leads from the get-go. Grab instant attention: Regardless of which video ad type you’re using, you have to grab people’s attention in the first one to two seconds or you’re going to lose them. Yes, this a challenge but anything less will mean your video ad budget fails to get the return it needs. Make it emotional: The best ads move people emotionally. Video has a potent mix of visual and audio triggers to work with – so use them. Create prominent CTAs: Don’t let users miss your calls to action. Make them prominent and tell people exactly what they need to do next. Make the most of TrueView ads: All of the YouTube ad formats have their uses, but TrueView video ads are generally where the focus of your campaigns should be. Combine ad types: Using different ad types to reinforce the main message in your campaigns can make all the difference – for example, using bumper ads to support your TrueView campaigns. 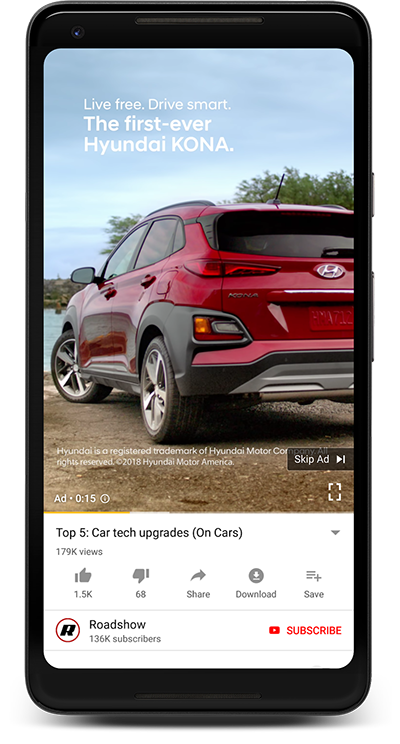 Know where to place your ads: The key to YouTube advertising is pinpointing the videos your target audiences are watching before making those purchase decisions. In many cases, it’ll be obvious (e.g. product reviews) but there are a lot of opportunities on indirect placements (e.g. advertising health supplements on recipe videos). Master YouTube’s targeting options: Once you’re producing great ads and you know where to place them, it all comes down to mastering YouTube’s targeting options to get them seen by the right people. Set up YouTube remarketing: Reach out to people who have previously interacted with your ads by using YouTube remarketing. These are the people most likely to take meaningful action. Add interactive elements to your ads: Add CTAs, overlays, cards and other interactive elements to increase engagement and drive action from your ads. Promote your content via YouTube ads: Place ads on topically relevant videos promoting your content to generate leads (e.g. your guide to healthy eating on recipe videos). With millions of people turning to YouTube every day for help with making purchasing decisions, the platform is every bit as capable as Google Search when it comes to generating leads from people ready to buy now. At the same time, you can capture leads at much earlier stages of the consumer journey with the targeting options at your disposal, and by combining different ad formats to create an ongoing story that guides consumers towards the finishing line.